Dr. Martin Luther King once described Sunday morning as the most segregated time in America with whites going to white churches and blacks and other minorities going to ethnic churches. But that maybe changing as more are Christians opting to join multi-ethnic mega churches. 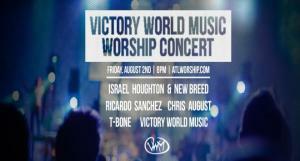 Cyndi Hill, who is half Korean, and Jose Ferrell, who is African-American, are two people who have opted for the mega church experience at Victory World Church in Atlanta, GA. Both Hill and Ferrell said they came to the church through word of mouth. "Our best friends invited us to Victory World Church and we loved Pastor Dennis Rouse's style and the message of his sermons," said Hill. She said the mega church experience offers a lot more than the small ethnic churches. "I love how there are multiple areas of ministry to get involved in," Hill said. "There's more variety in everything, not just in a congregation but even in style of worship. In a small church you usually only have one or two people that lead worship and you're at the mercy of whatever style of music they like. In a church such as Victory, because of how big and diverse it is, you are exposed to several styles of music and as a singer, I love that." Ferrell is also enamored with the opportunities at a mega church. "From worship, to the pastor, to the abundance of resources and community opportunities," he said. "The difference between this and a smaller church has to be the overall feel. I think at a mega church you feel like you're part of something big. Also, from my experience, larger churches are better planned organized for services and events." However both Hill and Ferrell say there is a downside to the mega church experience. "I think there is a tendency to get 'lost in the crowd' especially for an introvert," Hill said. Ferrell agreed. "At a bigger church I think the most common thing you lose is identity," he said. "In that, at a smaller church you can know everyone and everyone know you and be in your life and care for you. Where at a larger church you can easily disappear in the background and be going through something in your life and have no one know, just from the sheer size of the church." But both Hill and Ferrell seem to be pleased with joining a mega church and they say it is a growing trend. "I think mega churches are popular because people want to be a part of something. Right now it seems as though it's the mega churches that have the resources to do that," Hill said. "I think mega churches are becoming more popular because of the worship experience and speaking," Ferrell added. "Worship at mega churches tends to be louder and passionate and people seem to feel freer to raise their hands when their hands are one of hundreds raised up in the air. Also, usually the quality of the speaker is what brought about the church size as well. If the message wasn't good, then the church wouldn't be a large church."